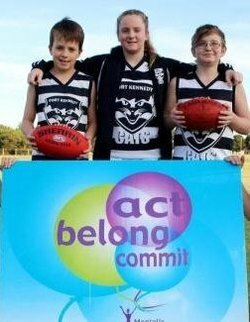 The club held its inaugural Act Belong Commit fun day last year and hopes to build on that success this weekend. Club president Simone Ireland said as a community-spirited Aussie Rules football club, the Port Kennedy Cats valued fun, family and members having pride in their club. “This event is to remind us that football is not just about the kids but the family as a whole and by participating together we can encourage a sense of belonging and commitment,” she said. The event will be held between 8.30am and 1pm at St Raphael Reserve in Port Kennedy. Port Kennedy Cats are made up of five junior teams and three big Auskick groups. The club competes in the Peel District Junior Competition and is applying to become an Act Belong Commit community partner. “We want to make sure we are always looking out for our members and their families,” Ireland said.